As a fairly new mom, I know how daunting it is to add “baby” to the travel equation. Before Seth came along, hubs and I spent less than 30 minutes packing for trips, sometimes as speedy as 15 minutes. We seldom (never, say never) miss any essentials. We packed like pros and learnt quite a few travel hacks along the way too – for example, packing clean rolled socks into our shoes to save space, using medicine containers for jewelry and vitamins, making sure we have a pen in our passport pouch for filling in arrival cards and packing light-weight gifts for the nice people we (will) meet. 1. It’s all in the mind. The first step to getting out of the door is saying ‘yes’ to traveling with your baby. I’ve heard parents say, “I’d travel after my baby turns one.” The reasons: “It’s too troublesome”, “Way too much stuff to bring”, “My baby won’t even remember it. 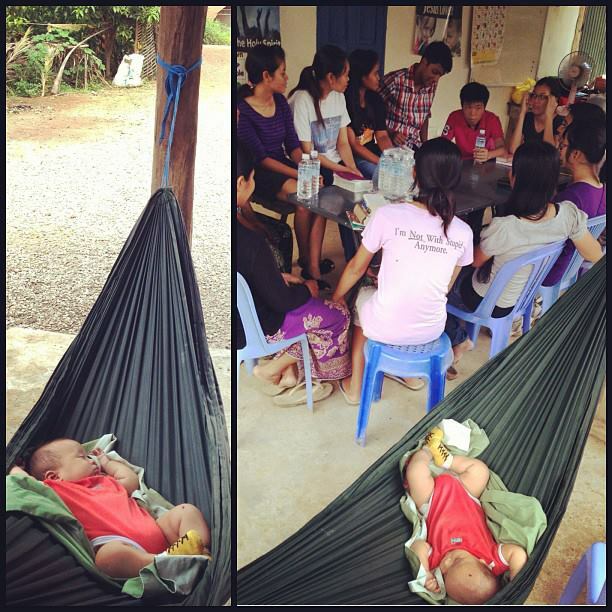 What’s the point?”, “My baby has to stick to a strict schedule”, “What if… what if… what if…” I’m certain Seth wouldn’t remember his first trip to Cambodia when he slept in a hammock in a village among cows and chickens while we chatted away with village folks – but photos will tell and more importantly, I learnt that babies are way more adaptable and versatile than we think. So let go and allow your baby to try new things and venture to new territories at a tender age. 2. Travel checklist. Here’s my basic baby travel checklist, mainly for tropical destinations. Depending on the type of travel and the expected weather conditions, I will add to this list as required. Sudocream – Essential for nappy rash, heat rash and it even works on insect bites. Mosquito patch – Doubles up as protection for you too if you’re carrying little bub. Bibs – Yes! You will need more than one because meal times can become messy. 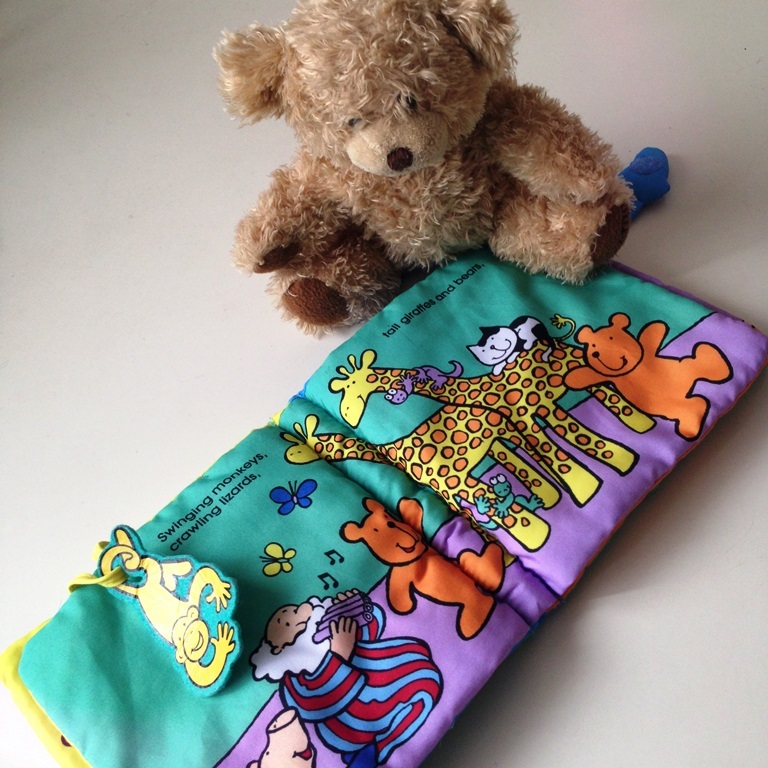 Small plastic bags for soiled diapers – And keeping the smells at bay. Bottles – Usually one would suffice, but for long haul trips, I bring two just in case. Sippy cup – After Seth turned 6 months, I added this to the list. Milk powder – After 7.5 months, Seth went fully on formula milk. If you are still breastfeeding, you have less to carry! Food & Snacks – Read No.3 & 4 for a variety of travel friendly food I love to have with me. Portable blender – A friend gave this to me and it’s the handiest tool. I’m not selling the brand, but you will probably find similar products in the market that blends baby food without the need to be electrically powered. Failing which, a fork would do the job too! Thermos – One of the most essential items to bring along. Hot water on the go anytime, anywhere. A toy and a book – Something to keep baby entertained. Don’t go overboard with toys, one is really enough for comfort sake. What I found interesting was, Seth loved travel brochures and magazines and we often read from these, making up stories of places and people. Tip: Improvise. Almost everything is entertaining to babies. Baby carrier – Best invention ever. Believe it or not, Seth has never used the pram since his birth. I just found using the carrier a lot more convenient and hassle free. A good one like an Ergo keeps shoulder and backaches away. 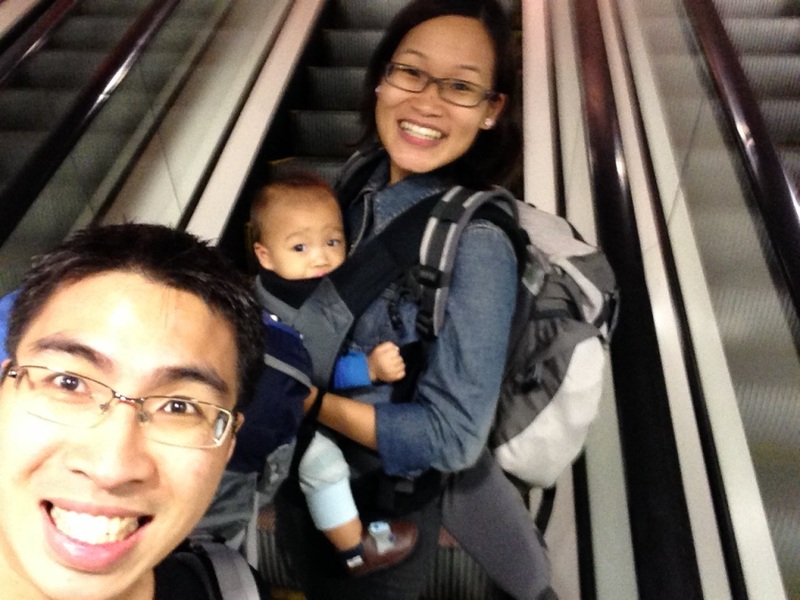 Get a lowdown on the best baby carriers at Babble Out before you purchase one. It’s a worthwhile investment! Medicine – For extended trips (more than a week) I usually stash the basic flu, cough and fever meds with me and a syringe. Thankfully I never had to use the stash, but it’s wise to have it with you to avoid hefty medical bills or hunting for a pharmacy. 3. Food. Depending on how old your baby is and how long you are gone for, the food selection can vary. At six months, everything that Seth ate was bland, bland, bland. After eight months, the taste experiment started and since then, Seth has been pinching from our plates every time we eat. I will feed him till he’s almost full and then leave room for tasting. Must have – A small container of rice cereal to mix with veggie or fruit. Weetbix works too. 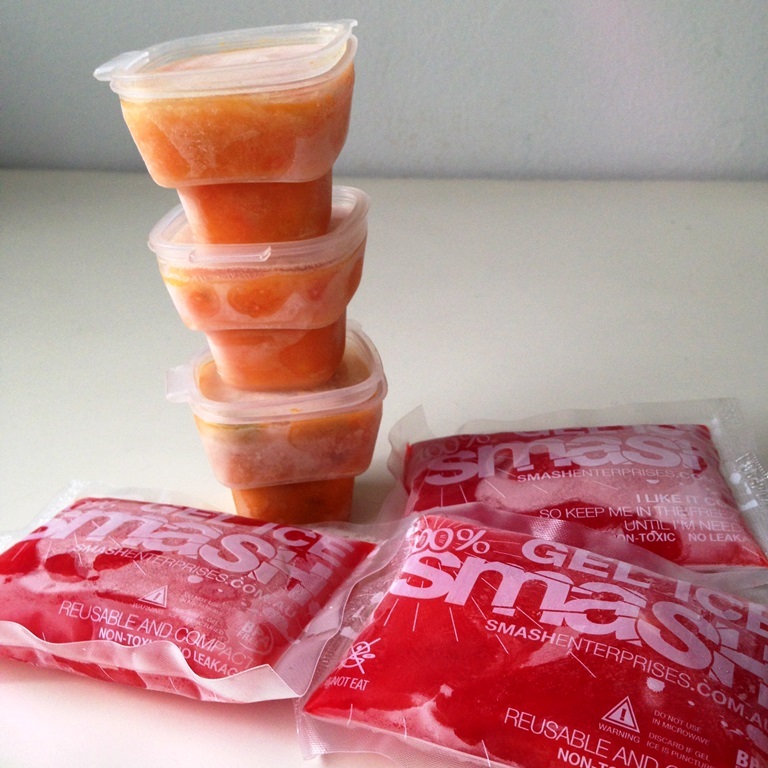 Purees – I make these ahead of time, store them in small containers and pack them in freezer bags with ice packs. I carry the freezer bag with me on the airplane if I’m flying. At the hotel, I transfer them into the fridge. But if I’m camping or there’s no fridge available, I will bring mashable food items such as bananas, papayas and avocados. How much food to bring? I will bring anywhere from 4-8 serves and spread it out throughout the trip. There is no point in bringing more than 8 serves as you want the food to be as fresh as possible. 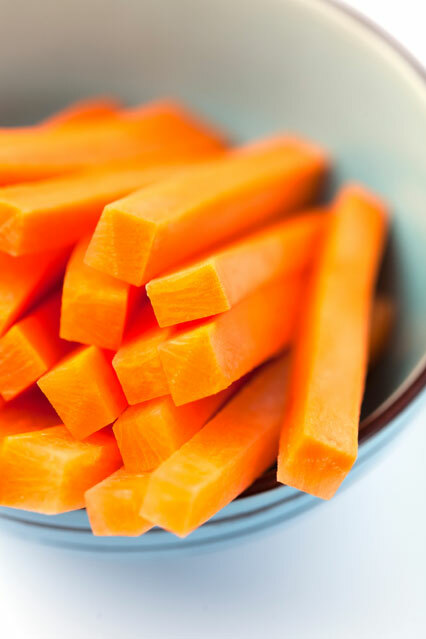 When my supply depletes, we order baby-friendly food such as steamed veggies on the side, porridge or stews. 4. Snacks. The last thing you want is to feed your baby some Twisties because you don’t have anything at hand. And when your baby starts teething, that’s also when they start snacking the most. Seth loves cucumber and carrot sticks, especially when they are chilled, healthy rice crispies and water crackers are great too and assorted whole grain cereal with dried fruit. I’m sure you have your own baby travel tips too. Care to share? I’d love to hear yours. Share them in the comments section below. 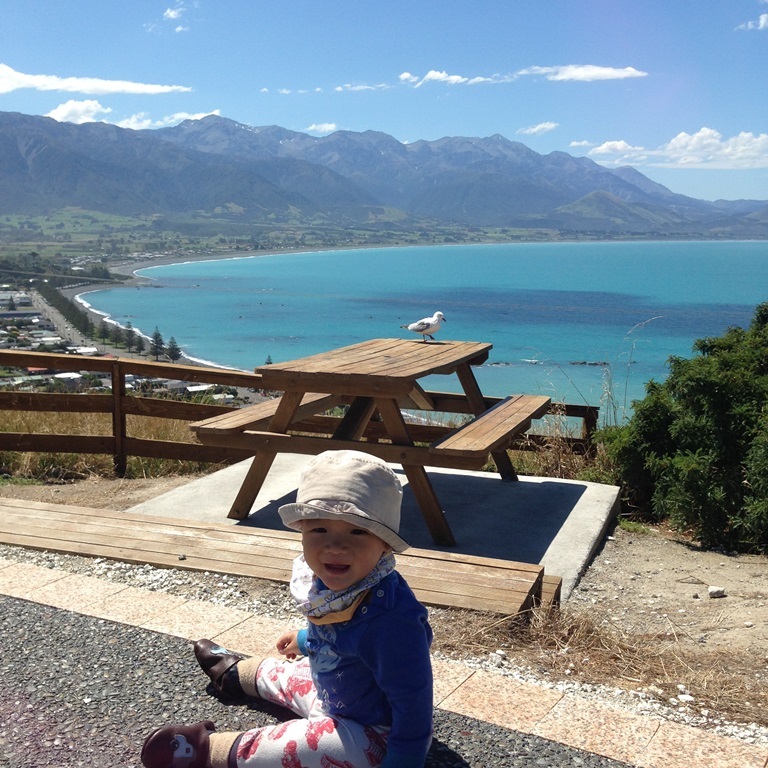 Now giddy up, plan the next trip, pack away and have a fab time exploring the world with your little one! Read also: Baby in a Spaceship.